I usually give away a book or two every time I review a stack, and I have quite a few books to give away in this post! Keep reading and comment to enter below! Share for more entries (each entry must also include a comment on this post). Below are 10 books (and a coloring book) that you might check out for YOURSELF this school year (or any time)! 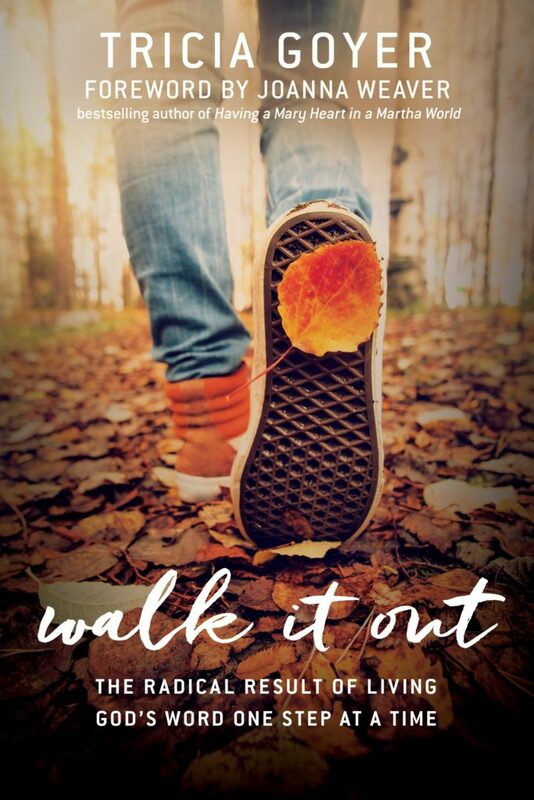 Tricia Goyer sent me an advanced reader of her latest Christian book, Walk it Out – which is about walking out your unique, important story with the Lord. I’ve skimmed this book over and plan to use it as a mom devotional for the first month of “Back to School” (which starts in just a week or so for us). I love how she talks about living out her life as God makes His Word clear to her – “radical living” in obedience, focusing on His plans for her and not her own, even if it is messy and not at all how she would have imagined. Topics she shares are defining moments, loving and serving from a healed heart (and a lot about healing itself), creating white space, purpose, telling your story, family, giving, the work you are meant to do, etc. I love how she includes devotional application questions at the end of each chapter to help you apply some of the truth God has shared through her. I’m really looking forward to diggin’ in to this one! 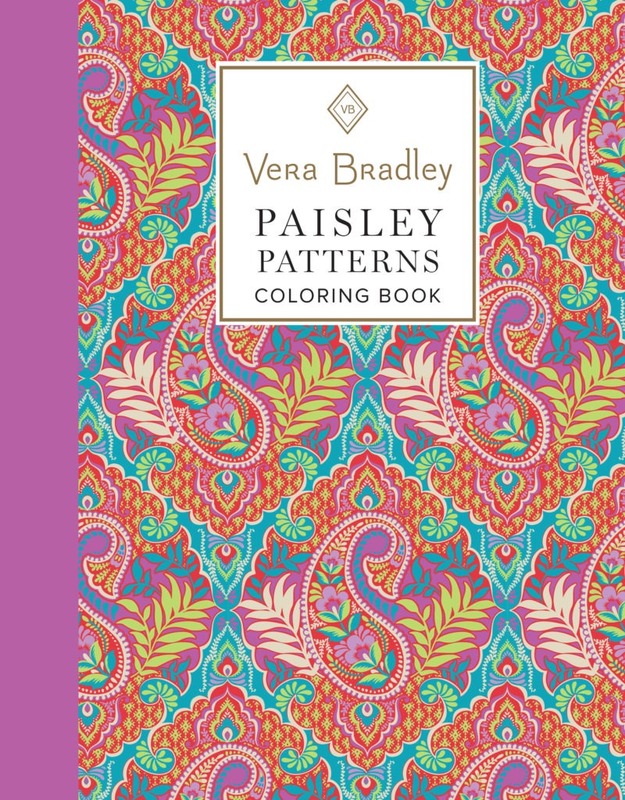 Vera Bradley has some amazing adult coloring books to help mom participate with the kids during art lessons, or just to unwind. They are therapeutic and all the rage right now. I’ve been seeing them in the grocery store check-out lanes everywhere! I like how thick the pages are in these books. They could be used with watercolor pencils if you don’t put too much water on the page. The back of each book has gift tags and small cards that are perforated so you could send them in the mail. Many of the pages have pretty quotes in whimsical fonts, also. Once you are done, you could use them as art for your gallery wall. The ones I have are Paisley Patterns and Floral Patterns. My 18 year old daughter is begging me to let her have one of them. These were review items and I’m planning to use them at the school table this year while the boys are coloring their history timeline figures to keep me from getting distracted by all the “stuff that needs to get done” which vies for mama’s attention. Don’t ever let anyone tell you that coloring inside the lines isn’t creative or good for you. Want to know HOW it is good for you? Here are 7 ways adult coloring is good for you. Even kids should learn this skill. 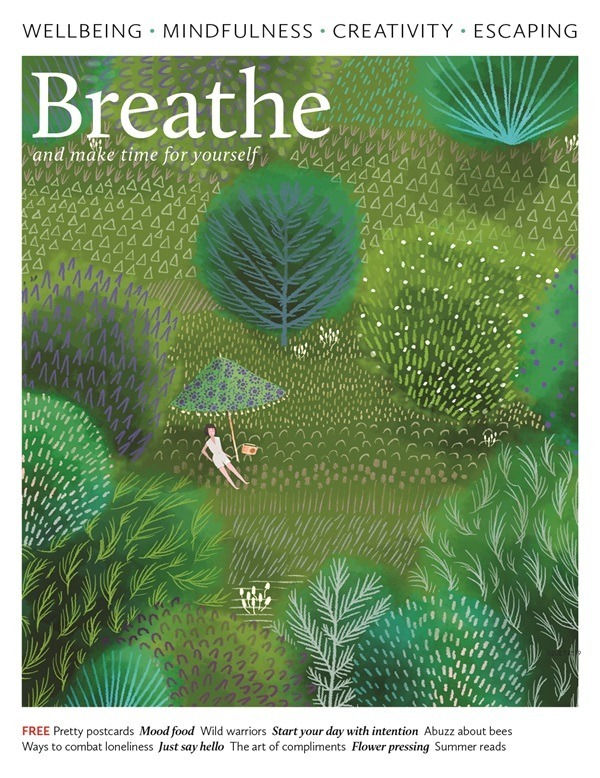 When I was healing from cancer after surgery, I picked up a copy of Breathe Magazine at Barnes & Nobles. I thoroughly enjoyed reading the articles in the print copy I had (they also offer a bi-monthly Kindle edition). They print lovely artwork and paintings, and focus on uplifting themes such as: wellbeing, mindfulness, creativity, escaping, and making time for yourself. What homeschool mama doesn’t need more of these things in their lives? We are always so focused on the family and kids, even our husbands and the sweet fur children… but mama has to learn how to take care of herself. I’m raising my hand as a big loser in this area since I’m pretty sure my stress is what sent me over the edge and caused my cancer episode. Some things you can’t help – but there is a lot you CAN do to unwind and take life a little slower. That’s what this magazine is about! I also loved that my first copy (Issue 3) came with free wrapping paper, gift tags, postcards, and a neat little listography book – a book for ME TO MAKE LISTS IN!!! You all know if you’ve been reading here for any length of time how much of a list-maker I am! This spoke to my heart. 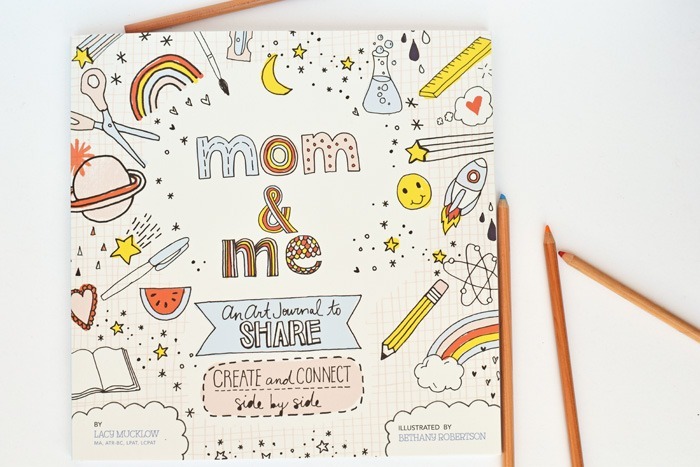 As an art-lover, I thought Mom & Me (a shared art journal) was such a great idea. Back in the day, I used to do this with my girlfriends at school. We shared a spiral notebook and passed drawings and notes and quizzes back and forth to each other. What a neat idea to do this with your child, so you can share a little of your creative spark with them and they can get to know you better on a level they might not otherwise. This book has neat prompts for drawing and writing such as what scares you, what makes you happy, your hopes and dreams, hand-lettering, accomplishments you are proud of, what you like about yourself, memories, what you are thankful for… etc. I love the artwork in this book – simple, yet so fun. This one will be on the keepsake shelf along with your family photo albums when you get it completed! This would make a fun art class for a homeschool co-op or just a project to do for art at home. 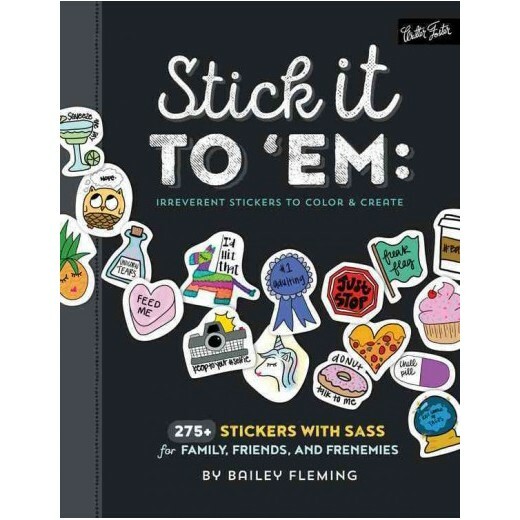 Stick it TO ‘EM: Irreverent Stickers to Color & Create is definitely a grown up sticker book. A few of the stickers have to do with alcohol and/or imply major snark, but some are really funny and cute. I adore the “Keep to your #Selfie” camera sticker, the “Chill Pill”, the unicorn, the “Unicorn Tears” bottle, and the “100% Chance of Tacos”. This doubles as a coloring book, also. There are stickers in the back which you can continue to draw on or color in with whatever medium you desire. I have been using the big HUGE address labels in the back of the book for mailing packages – love them as they are just the right size to pop on top of a label and re-use an envelope to save money. Since I’m a paper-back swapper, this is a handy sticker. I also am enjoying adding these to my teacher planner. I always use stickers in my calendar each week. If you are an 80’s child at heart and still have a Lisa Frank sticker book somewhere hidden in your closet, this book is for you. Wait, did I just date myself and say that out-loud?!! And then there is this little gem of a review item (lucky me!). Of course you might guess that a list-maker loves to WRITE. I adore hand-lettering and think it is such an artistic and creative talent (and a great one for those who may not have time for the more demanding pursuits of oil painting and other mess-making adventures). This is a great companion book for a 30-Day Bible Lettering challenge! 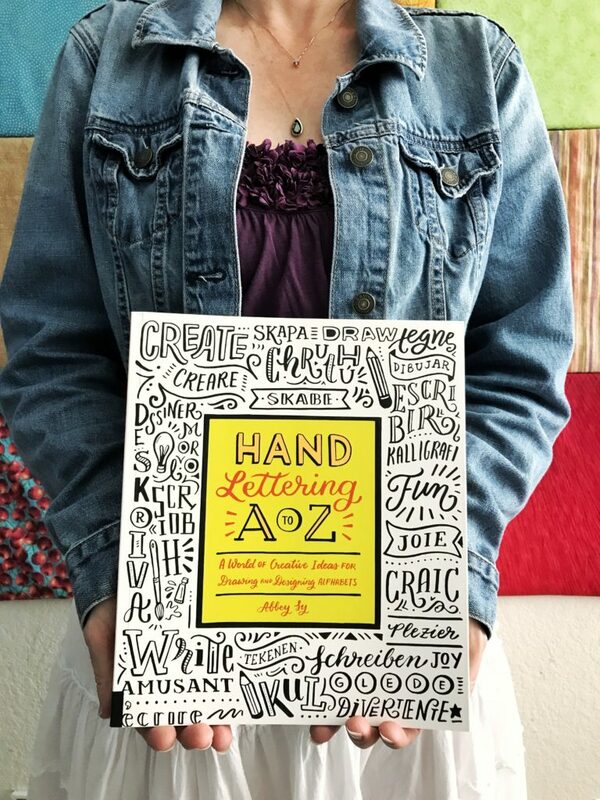 I love the ideas and examples in this book – which is exactly what the title suggests: Hand Lettering A to Z “A world of creative ideas for drawing and designing alphabets.” Here’s a secret: There are some amazing full page spreads in here that could qualify as framed art! If you happened to be a book butcher, or want to buy a copy to read and a copy to mutilate, you could use quite a number of these pages as fodder for your gallery wall. As you can see, I’m all about the gallery walls lately. I’ve been getting ready to finish one of mine downstairs so we can stage our house to sell. But… that’s for another post. Fortify Your Life is a guide to vitamins and minerals. I do a lot of reading about health, and this is a book that I picked up at my latest food conference, along with a book from Stonyfield Farm’s CEO, Gary Hirshberg. I’m throwing a copy of each of these in to this give-away because I have two. It can’t ever hurt to learn more about nutrition or organic farming. 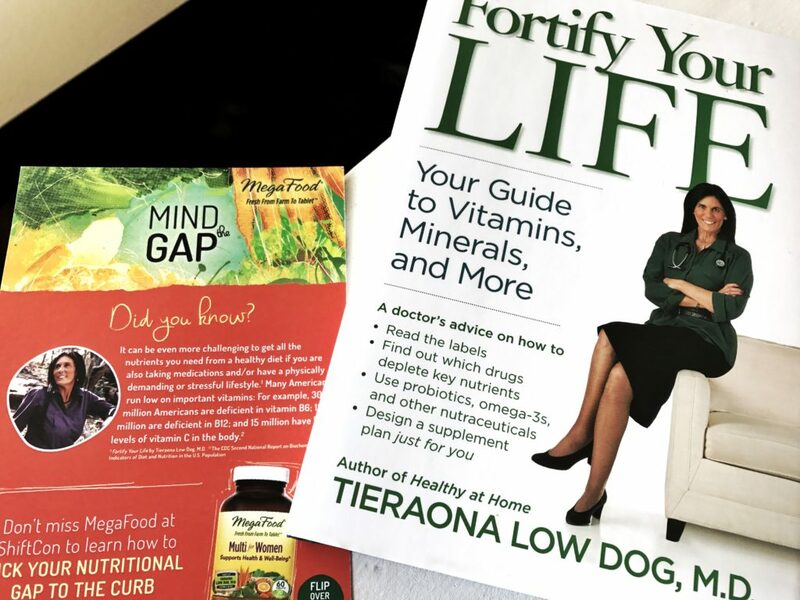 I use MegaFood’s multivitamins every day, and enjoyed listening to Tieraona Low Dog, M.D. speak at Shift-Con last December. 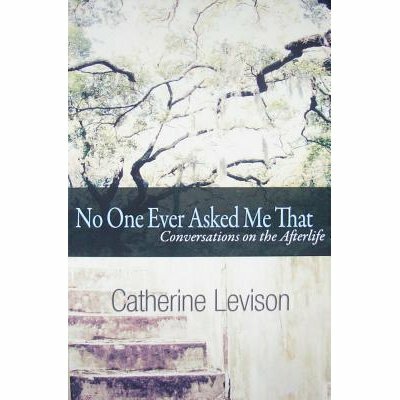 Catherine Levison is a veteran homeschool mama and an amazing writer and thinker. I have so enjoyed getting to know her through her online Charlotte Mason group that she graciously helped salvage on Yahoo Groups when the other leaders stepped down. She has written other books on Charlotte Mason homeschooling, but this book is a different kind of read. No One Ever Asked Me That is about meaningful conversations – sharing honestly with others who are different than us. The book discusses imagination and the after-life from a wide array of diverse angles – as shared through the candid interviews with people of all walks of life. She interviews a building director, a nuclear scientist, a physical therapist, a Native American, a newspaper editor, a Muslim woman, a recent graduate, a young girl, a photographer, a Jewish Mystic, a terminal cancer patient, an artist, a pharmacist, a Vietnam Veteran, a Christian pastor, and more! It’s so neat to listen to the deepest thoughts of so many different people. This is the kind of book that brings people together and heals division, all while sharing answers to some of life’s toughest questions. Catherine has graciously offered me a second copy of this book to give to one of my readers… and she’s thrown in a bookmark, to boot! 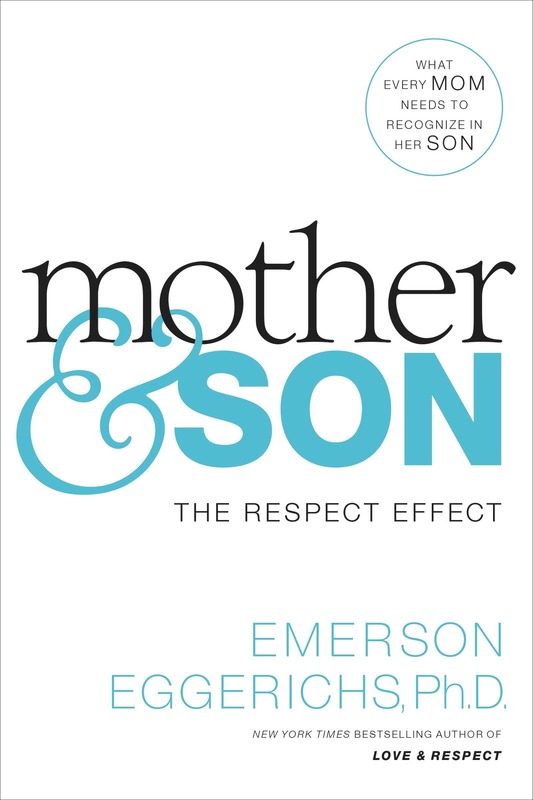 Mother & Son THE RESPECT EFFECT is a book I got as a review item. As a mom of three boys, I can say that this book is a must-read. If you haven’t had brothers and/or your father has not played a large role in your life, you especially should pick this one up. I love the message the book shares with moms about how “respect is the key to her son’s heart”. It is true that a man filters the world more through the grid of respect. Men base a lot of their worth on being able to provide, able to conquer, able to be the one to get the job done. Building a boy up in this manner is a sure-fire way to make a strong, faithful man who knows his worth. This book is written from a Christian perspective. The best part is – it is never too late, or too early to begin to go beyond just loving your son, but also showing him that you respect him as a person. This blends perfectly with Charlotte Mason’s statement that a child is born a person… and is worthy of being treated with respect. This last book is not in my hands yet… but it is on my list. 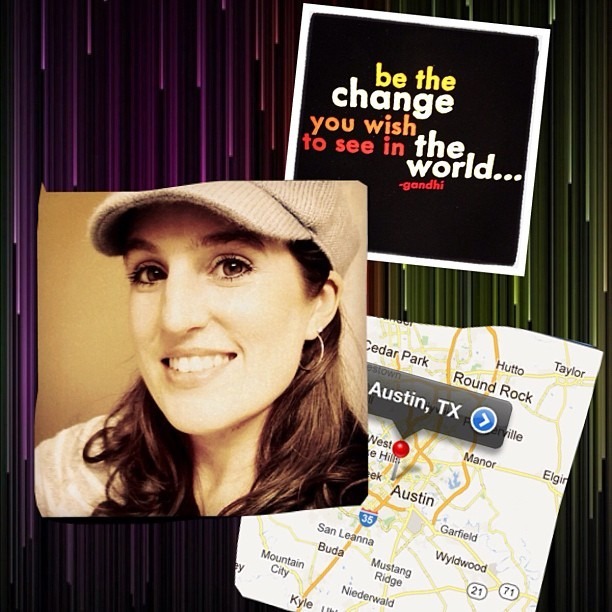 Leah Segedie is a blogging friend and runs the Shift-Con conference (organic foods and healthy eating/lifestyle). I learned so much when I was there last time. 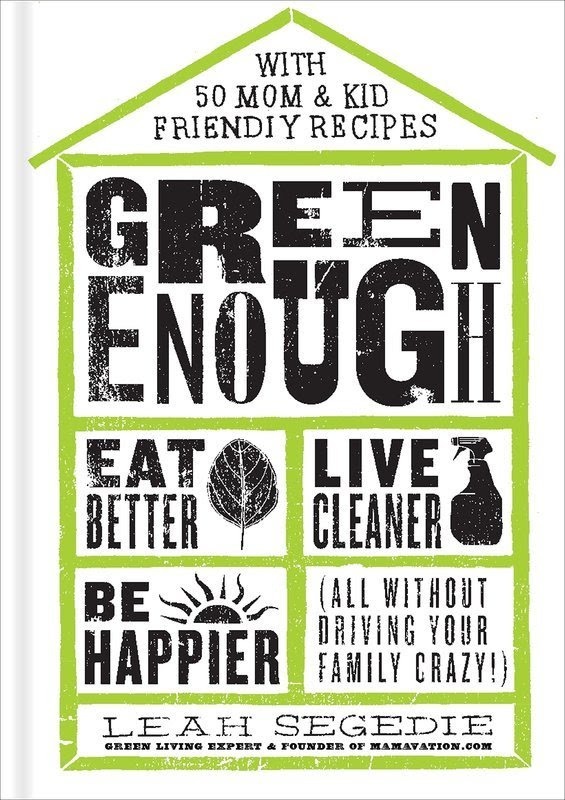 Can’t wait to read her book, “Green Enough“. In fact, I have quite a few friends who are writing books lately… and I’m excited to read them all. Leah is doing a pre-order sale at Amazon for this title, so hop on the sales wagon and grab up a copy for yourself. It is almost 10$ off the regular price. The book will be releasing next spring! Just in time for spring cleaning. You can get one entry per each share, follow and first comment. Be sure to leave a comment for each share or follow, though, or it won’t count! 1. Leave a comment below with something you found interesting about a book in this post, why you want the book, or tell me about your homeschool/school year plans… let’s get the conversation started! 2. Share this post on any social media site and be sure to leave a link and another comment so I can follow. 3. Follow me on Pinterest, Instagram, Twitter, and/or my RSS for this blog on your chosen reader. 4. Sign up for email updates for this blog and let me know you did so and your email address. I’ll wrap this up at the end of the month, August 31st, and I’ll allow winner #1 and #2 to pick the books they want! Sorry, but #3 will have to just take whichever one is left. Not a bad deal, if you ask me! Can’t beat free books! Happy reading, coloring, and learning!!! Disclaimer: Most of these books were review items sent to me by the author or publisher as I mentioned in the post; however, all of the opinions expressed are my own. Many of the links on this page are also amazon affiliate links, and if you purchase the books after clicking over to Amazon, they may give me a penny or two! Thanks for your support of my site and my homeschooling book habits! The Breathe magazine sounds like exactly what I need. I’ve never heard of it before. Thanks for the introduction and this giveaway. I just love the magazine, and unfortunately, it isn’t one of my choices for giving away of the 5 I have… so I’ve requested some digital copies for those of you who are interested and will see if they get back to me! I hope they will! The book that spoke to me the most was Fortify Your Life. I’ve been trying to figure out the right supplements and vitamins for our healthiest living. This looks like it would help! I will be homeschooling my 13 year old son this year, working on 8th grade! It’s my 22nd year of homeschooling, and I’m switching things up a bit, which is exciting! Love following along on your journey! Since you are the only one interested in the health books, I’ll send those to you ASAP – just email me (info on contact page). Hope you have a fabulous homeschool year! The stickers!!! What???? These would be cool for our school… and the hand lettering ( I’ve been eyeing that one because we have pen pals and write a lot of letters). Great selection all-in-all. I have that reaction to stickers, also. Unfortunately, the sticker book isn’t one of those that I have extra to give away. We do pen pals also! My little boys are getting their first pen pals this year. Breathe. Breathe, Breathe. Reminds me the He is the breath of life, even when I am wheezy! Shoot me your email so I can send you a digital copy if the magazine agrees to share one with you! I sure hope they do! Definitley love the hand-lettering book as I have recently began Bible journaling and have to trace the lettering because I haven’t learned how to do it yet. I also love to color so the sticker book looks really fun too! Homeschool….well, this season is unique because we are preparing to move to Honduras to serve as full-time missionaries there for 3 years before ever coming back to the States. The kids will go to a mostly Spanish speaking school in our village but we will also be doing supplemental homeschooling to keep them on par for college (2 of ours are in high school this year). So it will be a new challenge for us but an exciting one too. I love the lettering books. We make handmade cards and I think those are great for fancying things up. I shared it on FB and tagged you. I follow you in lots of places! I signed up for your blog long ago. Oh the stickers are fun! I have not seen those before. I also like the mom and me journal. The lettering books looks lovely. I’m a scrapbooker and I do crafts, so these would certainly come in handy. You are the random winner of the coveted hand lettering book!!! Shoot me an email and share your address and I can get it in the mail next week. Thanks so much Heather! I just sent you an email with my mailing info!